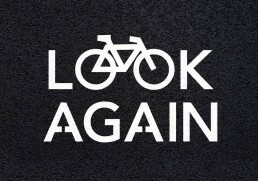 Bike Awareness Campaign - 6770 Design. Web. Advertising. Look. Look again. Save a life. 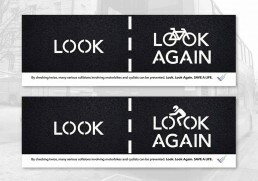 We created a bike awareness campaign for Merseyside Road Safety Partnership targeting drivers to make them more aware of other types of road users. Statistics showed that most accidents occurred at junctions or traffic lights where drivers failed to see cyclists or motorbikes. So the idea needed to be simple, eye-catching and something drivers would remember. The campaign was strategically promoted on bus backs throughout the region and across social media. 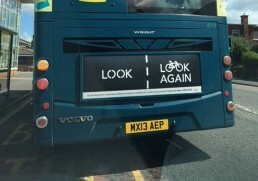 It was launched in the summer of 2018 by Merseyside Road Safety Partnership and supported by Merseyside Police and Merseyside Fire and Rescue Service.